Lt-Colonel Philip Huskinson Warwick, D.S.O., T.D. Philip Warwick was the son of Richard H. Warwick of Burgage Manor, Southwell. He was a director of the brewers Warwick and Richardson Ltd of Newark and a territorial member of the South Nottinghamshire Hussars Yeomanry for a number of years prior to the war (he was a 2nd Lieutenant as early as 1903). At the outbreak of war he was a Captain and rose to the rank of Lieutenant-Colonel shortly after the armistice. Upon declaration of war in 1914 the South Notts Hussars were mobilized and the then Captain Warwick, with two others, set about making the necessary transport acquisitions. In common with the 8th Battalion Sherwood Foresters they had little transport available and acquired coal carts, brewery drays and horses from various sources. The field strength at the time was around 500 men, which included a small number from Southwell and district. By 8th August the men were on the move to Norfolk and several thousand people saw them off from Nottingham – it must have been an impressive site, despite the ‘circus’ like transport vehicles that followed them. The Hussars received a considerable amount of training in Norfolk prior to being deployed to Egypt in early April 1915. Upon arrival in Egypt they were quartered in Abbassia Main Barracks, Cairo until July when they were moved to Kasr-el-Nil. By 11th August they were ordered to go dismounted to the Dardanelles. Two squadrons ‘B’ and ‘D’ were fitted out with infantry equipment, with squadron ‘B’ being commanded by Captain Warwick. The squadrons landed at Sulva Bay and quickly realised that they were to be engaged in an unpleasant war. They had to dig themselves in upon arrival and were being shelled – this was the first experience of war for most of them. Conditions were very unpleasant and they were soon involved in the Battle of Scimitar Hill, where they suffered heavy casualties. This was an experience shared by many from various regiments. The Newark Advertiser printed letters from Lieutenant A H Chambers of the Sherwood Foresters on 29th September and 10th November 1915 that graphically illustrated the dreadful conditions. On 3rd November 1915 the South Notts Hussars left Gallipoli and went to Mudros for two weeks of rest prior to returning to Egypt. They received battle honours: ‘Sulva’, Scimitar Hill’ and ‘Gallipoli 1915’. Once back in Egypt it was more training and the receipt of reinforcements prior to their despatch to Salonica in February 1916. Shortly after this deployment Captain Warwick took over command of ‘C’ Squadron and they were stationed near the Spanc River, where they were involved in several skirmishes whilst out on patrol. In July a high proportion of the battalion were hospitalised with malaria, this amounted to 50 officers and around 350 men. The battalion was moved to Guveyne in August to await the return of the men from hospital. Meanwhile they were involved in various actions against the Bulgarians. For a good proportion of their time in the Balkans outpost work was a feature, where they suffered frequent casualties. Not only had they to contend with the Bulgarian Cavalry, but also German Dragoons and Uhlans, and later Turkish Cavalry. 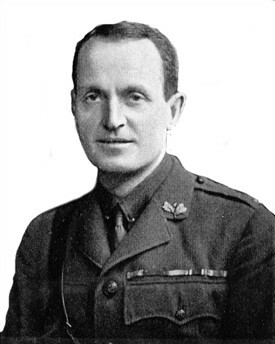 In December 1916 Philip Warwick was promoted to Major, which was followed by a period of leave. He returned to the fray in early February 1917 and continued to command ‘C’ Squadron. By late June the South Notts Hussars left Macedonia and sailed for Egypt, arriving at Alexandria on 29th June, 1917 and were rested for a while at Ismailia Ferry. Battle honours included ‘Struma’ and ‘Macedonia 1916-17’. They were at Ismailia for six weeks and training commenced with machine gun sections now being formed. Little else happened until August, when on the 6th they were inspected by General Sir Edmund Allenby and six days later they marched with the brigade to Khan Yunus, near Gaza, on the Palestine frontier, followed by a most difficult journey over the Sinai Desert for both men and horses. At this point in the war the prestige of the British was at a low point following the evacuation of Gallipoli, the fall of Kut-el-Amara and two unsuccessful attacks on Gaza in the spring of 1917. Turkish forces were on a wide front between Gaza and Beersheba – about 30 miles - and had the benefit of good roads and a railway. General Allenby undertook some reorganisation and formed the Desert Mounted Corps, of which the South Nottinghamshire Hussars Yeomanry were in the Corps Reserve. The total of British forces amounted to 76,000, of which 20,000 were mounted, with the enemy mustering 49,000. However, one of the problems was the heat at 110 degrees in the shade. The South Notts Hussars undertook a good deal of reconnaissance duties towards Beersheba prior to the attack on there, which took place on 30th October, 1917. The South Notts Hussars helped to overcome the Turks and Beersheba was secured, along with its important water resource. The advance continued and they headed towards Jerusalem. The Turks attacked at Nebi Samwail in an effort to regain lost ground and there were on-going battles with them. Towards the end of November Major Warwick took over command of the South Notts Hussars. They continued to be involved in a good deal of close quarter fighting and at the end of 1917 Jerusalem was taken. In early January Major Warwick was awarded the D.S.O. By April 1918 further re-organisation took place and the South Notts Hussars paraded for the last time as Cavalry and became a machine gun battalion with the Warwickshire Yeomanry. Fighting continued and the South Notts earned four more honours: ‘Gaza’, ‘El Mughir’, ‘Nebi Samwil’ and ‘Palestine 1917-18’. The battalion was moved to Sidi Bishr Camp with Major Warwick as Senior Officer of the South Notts Hussars Machine Gun Companies from 10th April to 13th July, 1918, prior to becoming Commanding Officer from 15th June. At this point the focus of training was on machine gunning, bayonet fighting, gas drills and infantry drill, clearly a move to France was in mind. On 22nd May, 1918 the order came to embark for France and the battalion set off the following day in the Leasowe Castle within a small protected convoy. At 12.12 a.m. on 27th April the ship was struck by a torpedo. An orderly evacuation commenced on a calm sea and all went well until one of the bulkheads gave way and the ship sank rapidly taking down 50 men with it (8 officers and 42 other ranks). The dead included Lieutenant John G. Warwick of Upton. Had the sea not been so calm the death toll would have been much higher. Major Warwick was injured with a blow on the head from a spar as the ship was sinking. Within a few days he was back on duty and took command of the battalion again. They had returned to Alexandria and on 18th June set sail in the Caledonia and reached the Italian port of Taranto safely. On 25th August they joined General Rawlinson’s Fourth Army and were sent to Worley, near Amiens, and undertook intensive training, including improving their machine gun efficiency. During September the battalion moved to Trônes Wood in the area of Albert and by 9th September they were in action and once again suffering casualties. Within a week they were involved in the attempt to break through the Hindenburg Line. Later that month Major Warwick returned from training and took over as 2nd in Command. Their next objective was the St Quentin Canal and Bellinglise. At this point the war was fast moving and on 8th October the battalion was assisting in the attack on Le Cateau and its eventual recapture on 23rd October. The South Notts Hussars added another battle honour of ‘Selle’ and continued with the advance right up to the Armistice. Other battle honours were ‘France and Flanders’, 1918 ‘Sambre’, ‘Beurevoir’, ‘St. Quentin Canal’, ‘Epehy’, ‘Hindenburg Line’. By 6th December Major Warwick was left in command and promoted to acting Lieutenant-Colonel. In January demobilization had commenced and in mid-April Lt.-Col. Warwick returned to England and on Thursday 27th May 1919 a memorial service, led by the Bishop of Southwell, was held. Philip Warwick was gazetted as Commander of the South Nottinghamshire Hussars Yeomanry on 29th June, 1920. This page was added by Mike Kirton on 15/08/2014. Having come across your web sight and reading through the story of Lt Col Philip Huskinson Warwick I was surprised to see in the group photo you published a man from the war memorial in my home town of Lyme Regis, Dorset. 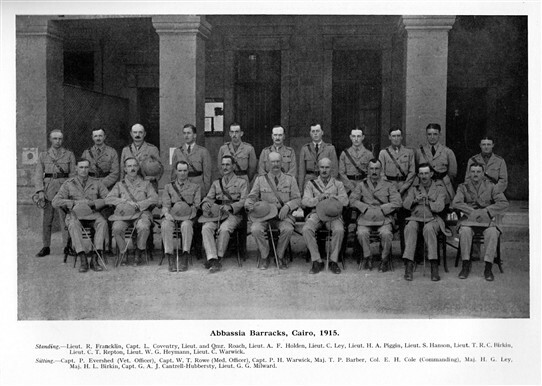 The photo shows the Officers of the South Nottinghamshire Hussars pictured at Abbassia Barracks, Cairo in 1915. I have been researching all those on our memorial gathering their stories for the local museum. I have also, where possible been trying to track down photos of them. Our man is Lieutenant C. T. Repton (back row, 3rd from right). I wondered if it would be possible to send me a copy of this photo as it would be great to add to the records. The photo on your sight is a bit too small so wondered if you had a larger copy. The man in question is Lieutenant Charles Thyrwitt Repton and he served with the South Nottinghamshire Hussars in Egypt and at Gallipoli before transferring to the Royal Flying Corps. He was killed when his aircraft crashed in Palestine in 1918.